Display is 10 digits, amber discharge tubes. Main integrated circuits - Solitron (?) SD9018, SD9019, SD9020A, SD9021, SD9022, all date coded to mid-1971. 375 x 149 x 80 mm (14.75" x 5.9" x 3.2"). Made in Japan, for Olympia Werke AG., Wilhelmshaven, Western Germany. The circuit boards are marked with the logo of Matsushita, the parent company of Panasonic. Probably one of the ugliest calculators ever made - it is basically a matt black slab. Also the display is level with the front of the keyboard which makes it awkward for viewing while entering numbers. At this time the integrated circuits were expensive and so are mounted in sockets for easy replacement should a fault occur. 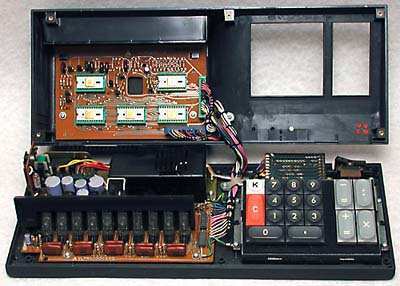 Inside, showing the 5 integrated circuits on one board and the display tubes and circuitry on the other. The 5 integrated circuits in their sockets. 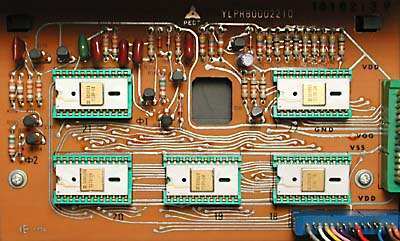 Note the triangular Matsushita logo at the top of the circuit board. 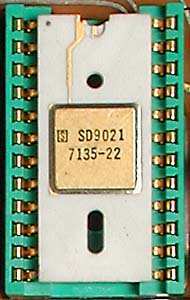 One of the integrated circuits in its socket. These are high grade ceramic packages. The logo of an "S" in a square indicates that it was manufactured by Solitron. The date code is 7135, ie. week 35 of 1971.